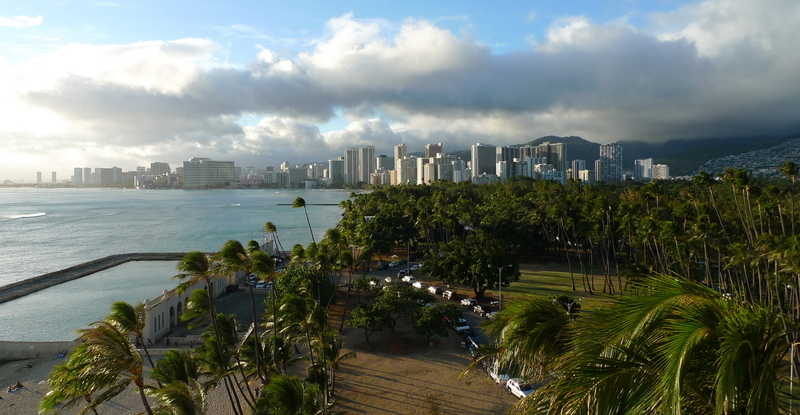 While in Honolulu, we stayed at the New Otani Kaimana Beach Hotel. Located close to Diamond Head on the south end of Waikiki, the New Otani is situated across from Kapiolani Park. It is a good value for many reasons. Its biggest selling point for me, was the view. This position is ideal because the hotel is quiet, set apart from the touristy, shopping mall busyness of Waikiki. Plus, you look back at the entire beach and skyline and take it all in. If you were staying in Waikiki proper, you wouldn’t have so broad a perspective. Here are some of the pictures I shot during our two nights at the hotel. 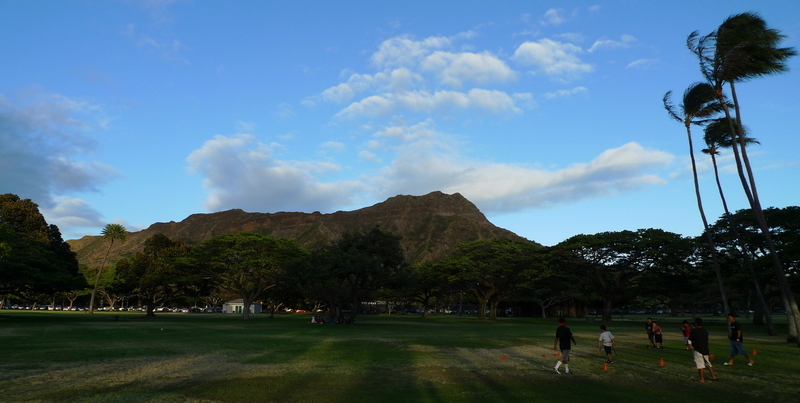 Kapiolani Park with Diamond Head in the background. Graceful palm trees backlit by the setting sun. Other visitors stop to capture a picture of the sunset. 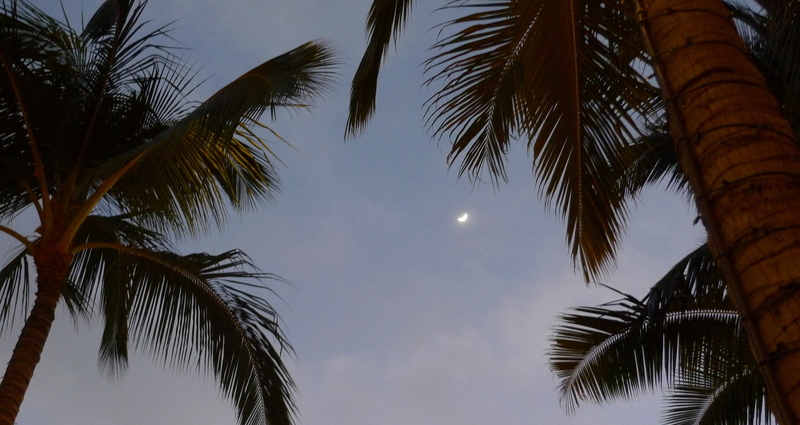 Just after sunset, I spotted the moon above the palm trees. 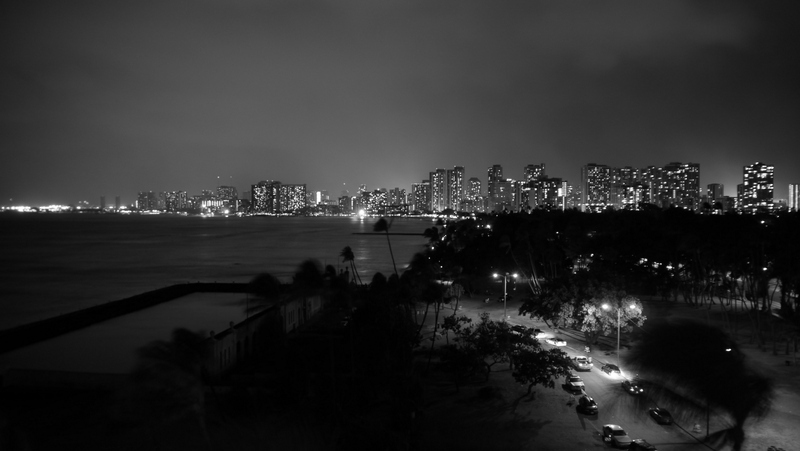 One final nighttime shot, in black-and-white. 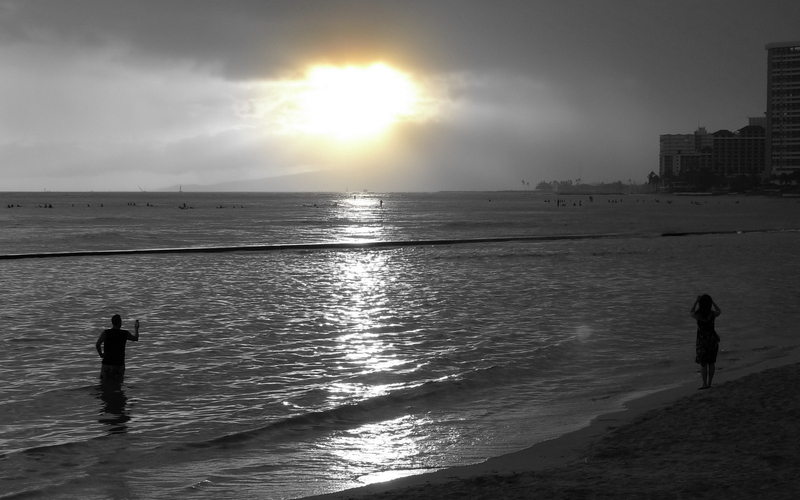 This entry was posted in Uncategorized and tagged Beach, Hawaii, Honolulu, hotel, Kaimana, Kapiolani, NewOtani, Oahu, Otani, park, sunset, travel, Waikiki by christao408. Bookmark the permalink. These shots are absolutely amazing. 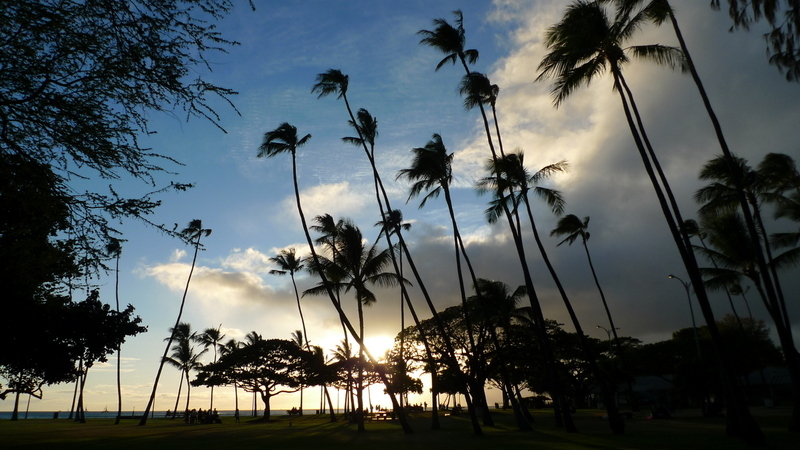 So idyllic!I love the one with the palm trees against the sky… as well as the sunset one. They really make me think of what it would be like to be stranded on a beautiful island. Gorgeous! Is that a pool built into the ocean? Now that is real ocean front property! I especially like the graceful palm trees back lit by the setting sun pic and the city at night pics, they captured it beautifully! Beautiful pictures! Thanks for sharing! Wonderful shots, Chris — New Otani was a good choice of hotel! I particularly like the trio of shots from the balcony at different times of day — beautiful! Breathtaking. The first picture looked like as if an artist had played with HIS paint brushes and made the world (me) cry at the beauty. Very nice shots indeed, can make postcards from these! 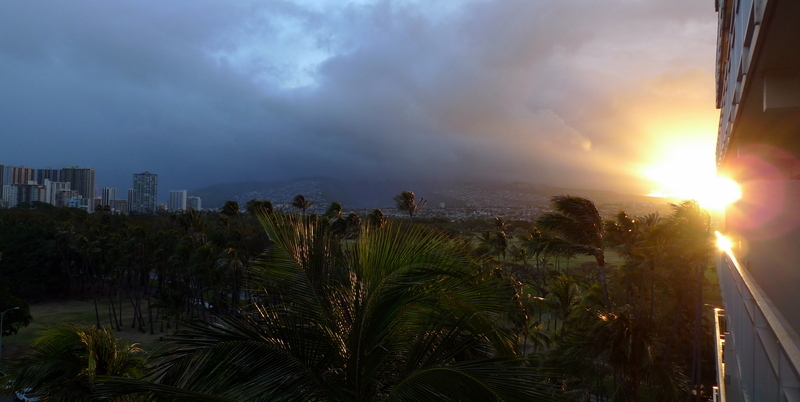 The trade winds are so representative to Hawaii! Talk about bringing back memories. Your photos took me right back to my visit. I’m glad you had a good time. @ZSA_MD – Thanks for the recommendation, Dr. Zakiah. Glad you liked that first shot. I woke up early our final morning there and went out on the balcony while Tawn was still sleeping. There’s certainly a very spiritual moment as the sun rises and you are there, in the calm, to witness it. @kunhuo42 – It is a beautiful place to call home. @grannykaren – @Fatcat723 – @Iedul Shabuur Kaiser – @CurryPuffy – @catstemplar2 – @ClimbUpTreesToLookForFish – Glad you enjoyed the pictures. @amygwen – Thanks, it was a fun couple of days. @slmret – If I had been planning a bit more, I guess I could have framed the shots identically. Well, I’ll have to remember that for next time! @seedsower – If I’m not mistaken, I think that used to be a public salt water pool. It is also close to the Waikiki Aquarium, so maybe has somethign to do with that? @stepaside_loser – Glad you enjoyed them. Go ahead, strand me on Hawaii! @christao408 – @seedsower – I believe that ‘pool’ used to be called the Natatorium (a fancy word for swimming pool!). It was there for decades, and was a salt-water pool. There was a bar just in front of it that was famous in its day but had become just a concrete foundation by the time I was there in the ’70’s. And it is in the middle of a long park area with a beautiful beach in front of it, across from the Honolulu Zoo and an outdoor shell amphitheater. Oh I love the view from the room. I just took a look at the hotel’s website – that Ocean Front Superior and those suites would suit me just fine. It’s good that the 2 of you had some quiet time together. u making me wish i was there. gosh, what a windy place waikiki is. @ElusiveWords – Yes, we ended up choosing a mid-range room because I thought the view looking back towards the park and city was more interesting than just looking out at the ocean. The only view I didn’t want was the one looking only at the park. @rudyhou – All of the islands are windy, thanks to the so-called trade winds. Keeps them much more pleasant, temperature-wise, than they otherwise might be. That does look very nice! @yang1815 – I’d recommend it.